San Diego Zoo Global was one of the first zoos to receive Fiji iguanas. 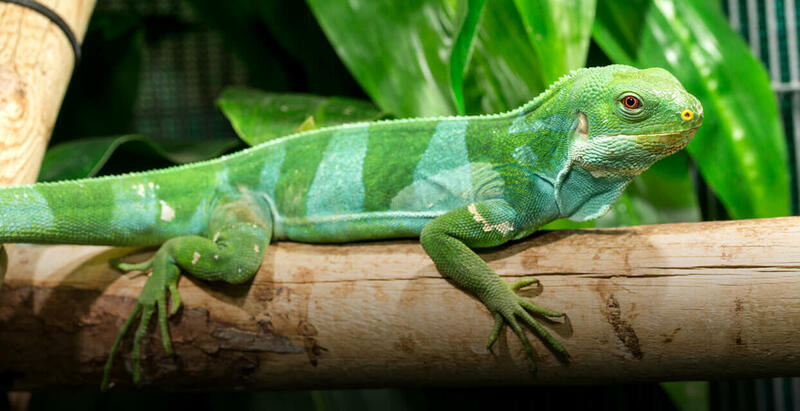 The Zoo’s Herpetology Department maintains the largest captive colony of these reptiles, and currently manages the Fiji Banded Iguana Species Survival Program (SSP). Several years ago, due to the atypical appearance of two of our iguanas, we initiated a genetics study to verify the species of our founder population, then identified as Lau banded iguanas. We also studied iguanas housed at Australia’s Taronga Zoo and samples collected from wild individuals by our partners for comparative purposes. Testing by our Conservation Genetics team was facilitated with funding from the International Iguana Foundation and revealed significant result. Through DNA sequencing, we learned that our captive founders and first generation offspring grouped with Fiji crested or Fiji banded iguanas instead of Lau banded iguanas, and microsatellite markers showed that our captive population included unexpected hybrids. These findings are critical to our long-term goal of maintaining a sustainable zoo population. Over the past five years, our partners in the field have performed extensive field surveys and collected samples from nearly 200 iguanas on 30 islands. Results from our DNA testing showed that wild Fiji iguana populations have much greater genetic diversity than previously thought. Nearly every island population sampled has a unique mitochondrial haplotype, including some never previously described. The data even suggest there is at least one new species, pending morphological assessments by our colleagues. These genetic studies have raised new questions about the appropriate conservation units for the iguanas, and helped determine priorities for protecting wild populations. Fiji iguanas are found on just 10-percent of Fiji’s 300 islands, with the majority of iguana populations still threatened and in decline. Through the SSP, we are hoping to support future conservation efforts for Fijian iguanas by strengthening existing collaborations and building new ones. We also hope to support educational outreach, enable habitat restoration, and provide husbandry guidance for other assurance colonies of iguanas within Fiji. Continuing efforts in the field and the lab are critical to future conservation efforts for all Fiji iguanas.